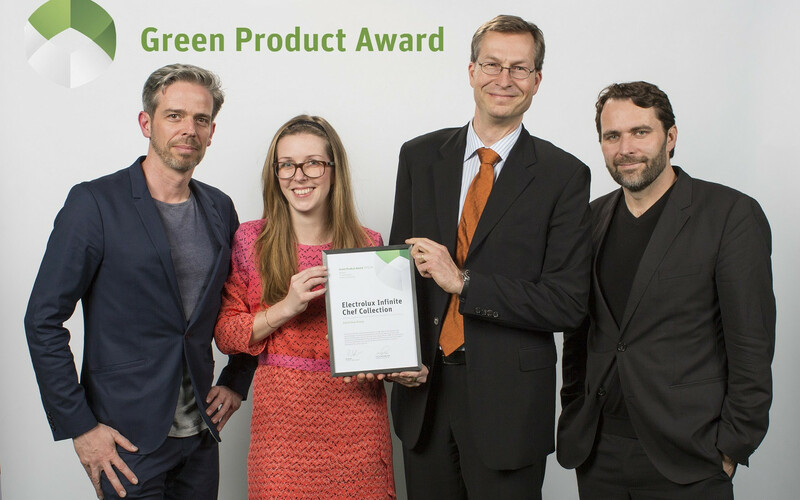 The closing event for the first ever Green Product Award took place on 17th March, in Berlin. Under the motto ‘New Sustainable Products & Innovations’, over 100 participants from business, scientific and political backgrounds came together to exchange experiences and be part of the award ceremony. The opening speeches from Nils Bader, founder of the Green Product Award and Kristina Kara, representative of B.A.U.M. e.V.’ patron, were followed by keynote presentations by top speakers from all over Europe. To allow for the broadest possible transfer of knowledge, the speakers focused their presentations on their approaches and experiences with the development of sustainable products. Julius Wiedemann from TASCHEN publishing opened the first block of lectures with an insight into the paradigm shift from printed to electronic books and the resulting sustainability aspects. ‘Future of Limited Space and Limited Resources’ was the presentation topic brought up by Helle Rex, CSR Manager at Howe a/s, as well as Howe’s motto for the implementation of the sustainability strategy in the development of new products. Michael Ohlendorf, CEO of Alpro GmbH Germany gave an insight into the importance of authenticity and brand building for the successful establishment of products in the area of ​​healthy eating. As representative of the University of the Arts, Bremen, Prof. Dr. Andreas Kramer gave an insight into the cooperation between universities and enterprises in product development. With a background of over 30 years of professional experience, Erwin Perlinger, former CEO of neuform eG and of the ReformKontor, shed light on the historical development of sustainable lifestyles and their interaction with new product concepts. Viktor Sundberg, Vice President of Environmental & EU Affairs at Electrolux, used his lecture to offer a global perspective on the development of sustainable products - from customer insights via market instruments, to the promotion of sustainable consumption, through to the activities of Electrolux, in order to successfully implement sustainable products. With detailed explanations, he sensitized the participants to the impact of products in the use phase especially. The closing of the keynotes was formed by Mimi Sewalski, CEO of Avocado Store GmbH, who provided the attendees with an insight into online market places, and useful tips - especially for newcomers – into their crucial initial steps. The actual ceremony offered a shared journey through the best submissions from each category and was concluded with the distinction of the award winners. According to the network approach, various opportunities were offered to promote direct exchanges between the event’s participants. After the event is also before the event, this is why the white lobster team is already preparing for the second Green Product Award and thus various projects for and together with the network. More photos of the event can be found in the album on our Facebook-Page(link is external).